دریابیگی زند, علی, ربیعی ابیانه, مریم, هویدی, حسن. (1397). مدیریت هواپیماهای مستعمل در ایران با رویکرد حفظ منابع و کاهش ردپای کربن. 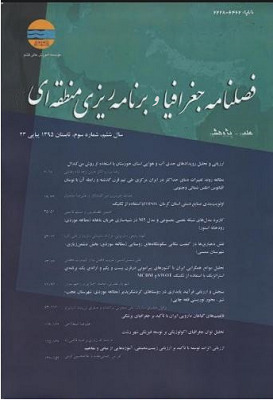 فصلنامه جغرافیا ( برنامه ریزی منطقه ای), 33(1), 307-318. علی دریابیگی زند; مریم ربیعی ابیانه; حسن هویدی. "مدیریت هواپیماهای مستعمل در ایران با رویکرد حفظ منابع و کاهش ردپای کربن". فصلنامه جغرافیا ( برنامه ریزی منطقه ای), 33, 1, 1397, 307-318. دریابیگی زند, علی, ربیعی ابیانه, مریم, هویدی, حسن. (1397). 'مدیریت هواپیماهای مستعمل در ایران با رویکرد حفظ منابع و کاهش ردپای کربن', فصلنامه جغرافیا ( برنامه ریزی منطقه ای), 33(1), pp. 307-318. دریابیگی زند, علی, ربیعی ابیانه, مریم, هویدی, حسن. مدیریت هواپیماهای مستعمل در ایران با رویکرد حفظ منابع و کاهش ردپای کربن. فصلنامه جغرافیا ( برنامه ریزی منطقه ای), 1397; 33(1): 307-318. در هر سال نزدیک به 400 فروند هواپیما در سراسر جهان از رده خارج می‌شوند. بدلیل توسعه صنعت حمل و نقل هوایی این تعداد بطور مداوم در حال افزایش است و انتظار می‌رود که تعداد هواپیماهای خارج از رده طی 20 سال آینده به 12000 تا 14000 برسد. یکی از بزرگترین مشکلات برای هواپیماهای مستعمل چگونگی از رده خارج کردن آنها است. هدف از انجام این تحقیق بررسی گزینه‌های مناسب مدیریت هواپیماها در مرحله پایان حیات با تمرکز بر گزینه بازیافت فلزات (آلومینیوم) به لحاظ اثرات محیط‌زیستی و اقتصادی آن بوده است. لذا در این مطالعه ابتدا به تجزیه و تحلیل وضعیت فعلی ناوگان هوایی کشور پرداخته شده. سپس مقدار آلومینیوم قابل بازیافت از هواپیماهای خارج از رده، میزان ذخیره انرژی و کاهش انتشارات CO2 در نتیجه بازیافت آلومینیوم و همچنین ارزش اقتصادی آلومینیوم قابل بازیافت محاسبه گردیده است. یافته‌ها حاکی از آن بود که با بازیابی آلومینیوم از هواپیماهای خارج از رده در ناوگان هوایی کشور، صرفه‌جویی در انرژی به میزان MJ 157358565.616، کاهش انتشارات CO2 به میزان kg 12539971.392 و سود مالی به میزان 194830064000 ریال حاصل می‌گردد. با توجه به فراهم آوردن مزایای قابل توجه محیط‌زیستی و اقتصادی، بازیافت مواد و قطعات هواپیما گزینه مناسب برای مدیریت هواپیماها در مرحله پایان حیات به نظر می‌رسد. Every year around 400 aircrafts are retired and taken out of service worldwide that is expected to increase steadily as aviation industry expands. The number of end-of-life airplanes is anticipated to research 12000 to 14000 in ca. two decades. Final safe and proper disposal of end-of-life aircrafts is recongized as a great environmental concern in many developed countries The main objective of this research was to evaluate the curent situation of waste management in aviation industry in Iran as well as examining the appropriate strategies for management of end-of-life aircrafts, emphasizing on aircraft waste recycling and its enviro-economic impacts. The current situation of the Iran’s air fleet has been investigated in this context followed by evaluation of the amount of recyclable aluminum from end-of-life aircrafts. Energy saving and carbon fotprint reduction as a result of aircraft recycling as well as its economic benefits were deterimned. Results indicated that more than 157358 Giga Joule could be saved through proper management of end-of-life aircrafts in Iran. In addition, carbon dioxide emission from this sector can be reduced by more than 12539 ton and financial benefit of 194830064000 Rials would be achieved by recycling of aluminum from end-of-life aircrafts of Iran aviation fleet. Obtained results quantitatively demonstrated significant environmental and economical benefits from proper management of aircraft wastes in aviation industry suggesting serious planning and promotion of recycling programs for end-of-life aircrafts in Iran. Asmatulu, E., Overcash, M., Twomey, J. (2013). Recycling of Aircraft: State of the Art in 2011, Journal of Industrial Engineering, Vol. 2013, Article ID 960581, 8 pages. Asmatulu, E., Twomey, J., Overcash, M. (2013). Evaluation of recycling efforts of aircraft companies in Wichita, Resources, Conservation and Recycling, Vol. 80, pp: 36– 45. Blockley, B., Shyy, W. (2010). Encyclopedia of Aerospace Engineering, Volume 6: Environmental Impact, Manufacturing and Operations, Chapter 306, Value Extraction from End-of-Life Aircraft, Chichester, West Sussex, U.K. : Wiley. Bouzarour-Amokrane, Y., Tchangani, A., Peres, F. (2015). Decision evaluation process in end-of-life systems management, Journal of Manufacturing Systems, Vol. 37, pp: 715–728. Camelot, A., Baptiste, P., Mascle, C. (2013). Decision support tool for the disassembly of reusable parts on an end-of-life aircraft, International Conference on Industrial Engineering and Systems Mnagement (IESM' 2013), October 28-30 2013, Rabat, Morocco. Dayi, O., Afasharzadeh, A., Mascle, C. (2016). A Lean based process planning for aircraft disassembly, IFAC-PapersOnLine, Vol. 49(2), pp: 54-59. EPA (2005). Introduction to Hazardous Waste Identification (40 CFR Parts 261). EPA (2017). Hazardous Waste Treatment, Storage, and Disposal Facilities (TSDF) Regulations, A User-Friendly Reference Document for RCRA Subtitle C Permit Writers and Permittees, EPA 530-R-11-006, Version 6. Feldhusen, J., Pollmanns, J., Heller, JE. (2011). End of Life Strategies in the Aviation Industry, Proceedings of the 18th CIRP International Conference on Life Cycle Engineering, Technische Universität Braunschweig, Braunschweig, Germany, May 2nd - 4th, 2011. Keivanpour, S., Ait Kadi, D. (2016). An integrated approach to analysis and modeling of End of Life phase of the complex products, IFAC-PapersOnLine, Vol. 49(12), pp: 1892–1897. Keivanpour, S., Ait-Kadi, D., Mascle., C. (2013). Toward a Strategic Approach to End-of-Life Aircraft Recycling Projects, Journal of Management and Sustainability, Vol. 3(3), pp: 76-94. Keivanpour, S., Ait-Kadi, D., Mascle., C. (2015). Toward a projection model for estimation of end of life aircrafts, 2015 International Conference on Industrial Engineering and Operations Management (IEOM), 3-5 March 2015, Dubai, United Arab Emirates. Keivanpour, S., Ait-Kadi, D., Mascle, C. (2017). End-of-life aircraft treatment in the context of sustainable development, lean management, and global business, International Journal of Sustainable Transportation, Vol. 11(5), pp: 357-380. Mascle, C. (2013). Product Design for Rebirth: Application to Aircraft Life Cycle Modeling, Supply Chain Forum: An International Journal, Vol.14(2), pp: 70-83. Mascle, C., Baptiste, P., Sainte Beuve, D., Camelot, A. (2015). Process for Advanced Management and Technologies of Aircraft EOL, Procedia CIRP, Vol. 26, pp: 299 – 304. Mascle, C, Yong liang, C., Aurore, C. (2014). Information Technology for Processing and Treating Aircraft End of Life, Applied Mechanics & Materials, Vol. 686, pp: 153-159. Muniz-Lerma, JA., Jung, IH., Brochu, M. (2016). Thermal Decoating of Aerospace Aluminum Alloys for Aircraft Recycling, Metallurgical and Materials Transactions B, Vol. 47B, pp: 1976-1985. Muniz-Lerma, JA.,Paliwal, M., Jung, IH., Brochu, M. (2017). Fractional Crystallization Model of Multicomponent Aluminum Alloys: A Case Study of Aircraft Recycling, Metallurgical and Materials Transactions B, Vol. 48, Issue 2, pp: 1024–1034. Perry, N., Mantaux, O., Leray, D., Lorriot, T. (2010). Composite recycling: design for environment approach requirements, proceeding of IDMME – Virtual Concept 2010, Bordeaux, FranceOctober 20-22. Pertsova, C. (2008). Ecological Economics Research Trends, chapter 1, Nova Science Publishers, Inc. New York. Ribeiro, JS., Gomes, JO. (2014). A Framework to Integrate the End-of-Life Aircraft in Preliminary Design, Procedia CIRP, Vol. 15, pp: 508 – 513. Ribeiro, JS., Gomes, JO. (2015). Proposed framework for End-Of-Life aircraft recycling, Procedia CIRP, pp: 311-316. Sabaghi, M., Cai, Y., Mascle, C., Baptiste, P. (2015). Sustainability assessment of dismantling strategies for end-of-life aircraft recycling, Resources, Conservation and Recycling, Vol. 102, pp: 163–169. Sabaghia, M., Cai,Y., Mascle, C., Baptiste, P. (2016). Towards a sustainable disassembly/dismantling in aerospace industry, Procedia CIRP, Vol. 40, pp: 156-161. Wijk, O., Andersson, P., Block, J., Righard, T. (2017). Phase-out maintenance optimization for an aircraft fleet, International Journal of Production Economics, Vol. 188, pp: 105–115. Wong, K., Rudd, C., Pickering, S., liu, X. (2017). Composites recycling solutions for the aviation industry, Science China Technological Sciences, Vol. 60(9), pp: 1291-1300. Zahedi, H., Mascle, C., Baptiste, P. (2015). A CONCEPTUAL FRAMEWORK TOWARD ADVANCED AIRCRAFT END-OF-LIFE TREATMENT USING PRODUCT AND PROCESS FEATURES, IFAC-PapersOnLine, Vol.48(3), pp: 767-772.